Marked for destruction, this 18th century Rhode Island house was meticulously dismantled in 1973 and rebuilt 27 years later, in CT.
William Gould Architectural Preservation, LLC offers an extensive inventory of dismantled historic houses and period barns for sale. If you have ever lived or worked in a well maintained historic building, then you know that these are the most delightfully livable structures built. They are comfortable to live in and they set comfortably and harmoniously into the landscape. Original, dismantled materials are the most powerful and efficient way to create the look and feel of authentic historic work at a new site. This is because the living presence of historic finishes is difficult and expensive to credibly counterfeit in completely new construction. All our dismantled barns and historic houses were originally built in New York or New England and are available for relocation anywhere in the United States. William Gould Architectural Preservation, LLC are preservation consultants and contractors with over three decades experience. We can furnish complete rebuilding services or can furnish the building only, for re-erection by your own qualified building team. 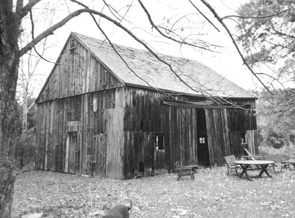 William Gould relocates this historic barn, masonry foundation and timber frame first. These buildings are meticulously dismantled historic structures, fully documented, labeled, and packaged in order to preserve their historic character as economically as possible. Our historic house and barn packages include every original frame and finish element which contributes to the unmistakable eloquence of the historic building. These include the complete timber frame, all blocking and nailers, exterior and interior finish goods, mouldings, doors, windows, flooring, hardware and masonry. After many years of dismantling and preserving historic buildings, we have refined our storage and labeling systems to allow efficient re-erection by any qualified builder. Should you prefer, we can furnish you with a complete turnkey contract proposal for the whole rebuilding project. Alternatively, we can deliver the building to your site for installation by your own qualified project team. Whatever role we play in the work, we remain committed to the complete success of the project and will consult with all participants, as necessary, at no cost. 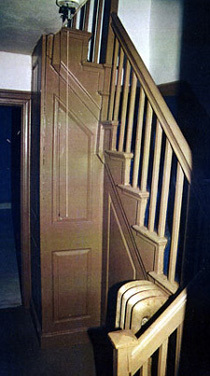 18th century paneled back stair. As many would be historic building owners have found to their sorrow, acquiring a condemned historic structure for "nothing" can seem an economy, but only by adhering to the most rigorous standards for documentation and storage can the integrity of historic materials be preserved and reassembly costs be controlled. Materials stored for even short intervals can rot or warp if stored improperly or be rendered effectively useless by incoherent labeling systems. We have been hired at considerable cost to redocument and reinventory confused and poorly labeled dismantled structures. We have also erected a building which we had dismantled and stored for almost three decades. Experience has shown that it doesn't pay to cut corners whether the dismantled material is to be stored for thirty years or thirty days. William Gould Architectural Preservation, LLC would be very pleased to help you to locate an endangered historic structure to your building site. 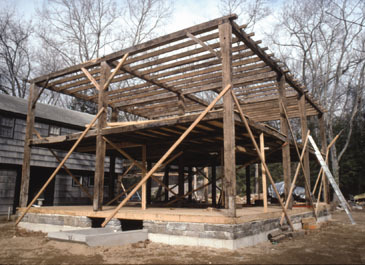 We are master carpenters and general contractors with long experience in the field of historic preservation. Bill Gould, owner of William Gould Architectural Preservation, LLC, is happy to advise you on your historic building project to make sure that the solution you select is practical, cost effective and truly meets your needs. We answer all emails, but prefer that initial serious project inquiries be made by telephone to 860-974-3448. Colonial era barn suitable for residential conversion. Bill Gould believes that we must recognize the contribution of the original, often anonymous, builders of these irreplaceable historic houses and barns. Previous to dismantling any significant historic building, we notify the state archaeologist so that the archaeologist can record and document the original site in an archival report. There is no charge for this and it benefits the new owner as well by helping to establish the provenance of the building. In all cases, these are unique, historic buildings whose only fault is to be in the wrong place in the wrong time. We dismantle only endangered historic buildings which can be saved no other way.